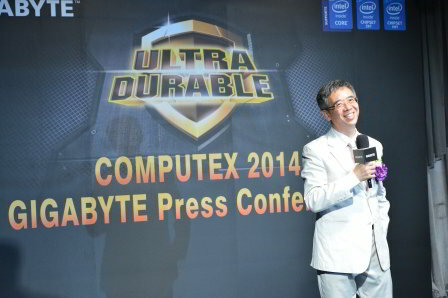 GIGABYTE has recently showcased their new Z97 G1 Gaming motherboards during Computex 2014. There are also Cosplay Exhibition and Gigabyte has also introduced their new Limited Edition Z97X-SOC FORCE LN2 that was able to break a new World Record Performance of 4.5GHz memory clock speed with Kingston HyperX DDR3 Memory. Check out the official press release before. 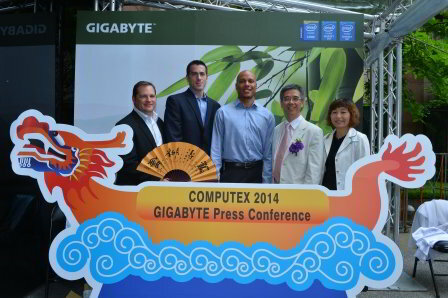 GIGABYTE TECHNOLOGY Co. Ltd., a leading manufacturer of motherboards and graphics cards co-hosted a press conference today with Intel to start off the Computex week to showcase their latest 9 series chipset based motherboards. 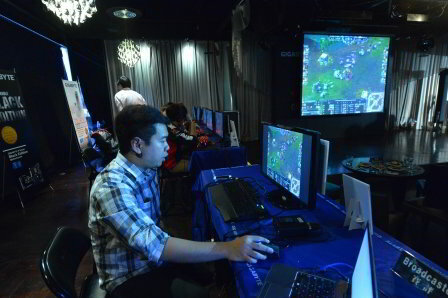 Held at the Brown Sugar jazz bar in downtown Taipei, Taiwan, GIGABYTE had a lot scheduled to keep their guest on their toes, including speeches both from Intel and GIGABYTE, a gaming session featuring cosplay girls from LOL and a world record breaking overclocking demonstration. Starting the press conference on the right foot, GIGABYTE Vice President of Motherboard Business Unit, Mr. Henry Kao, opened the event by welcoming everyone and providing a brief introduction to GIGABYTE’s market position and their close cooperation with Intel which has helped achieve the success that GIGABYTE sees today. 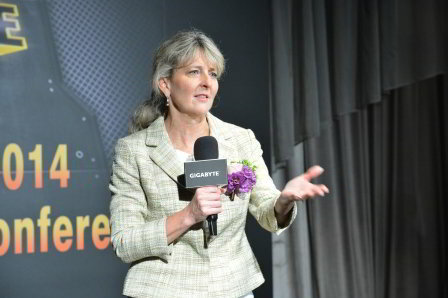 Next GIGABYTE VIP guess Lisa Graff, Intel Vice president of PC Client Group and General Manager of Desktop Client Group, introduced the latest innovations from Intel, including the new Haswell-E and Broadwell CPU, and mentioned how important the close relation with GIGABYTE to implement a “close to market need” design in the future chipset and CPU. 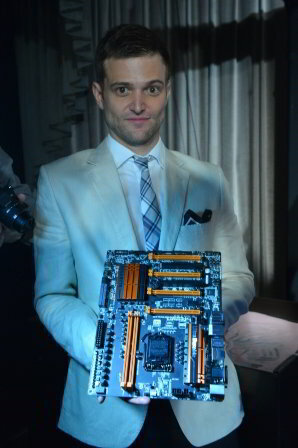 Next up was Colin Brix, Marketing Director of GIGABYTE Motherboard Business Unit to give a brief introduction to their newly launched 9 series motherboards based on the Intel® Z97/H97 chipsets with support for 4th and 5th generation Intel® Core™ processors. 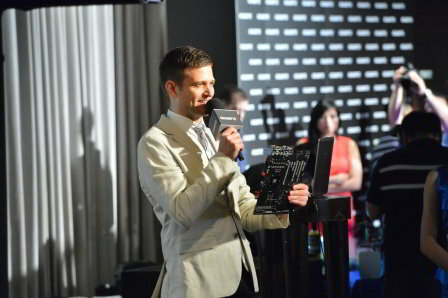 Following the introduction speeches, media and partners were able to witness GIGABYTE Overclocking Evangelist HiCookie officially launch the Z97X-SOC FORCE LN2, a limited edition motherboard designed to shatter all memory overclocking records. Specially engineered with 2 DIMM board and memory located nearest the CPU, HiCookie gave a step-by-step demonstration showcasing how easy it is to overclock the Z97X-SOC FORCE LN2 and was able to set the world’s highest frequency memory overclock record at 4.5 GHz stable using HyperX Predator memory from Kingston Technology, demolishing the almost year old record of 4.4 GHz. As the press conference was held in Taiwan on June 2nd, the national Taiwan Dragon Boat festival, GIGABYTE esteemed guess were able to enjoy typical food related with the festival as well as assist a gaming session demonstration by a League Of Legends cosplay all girls gaming team. Everyone could also take part of photo sessions with the LOL girls as well as Dragon Boat festival oriented theme. Below are some photos from the event.